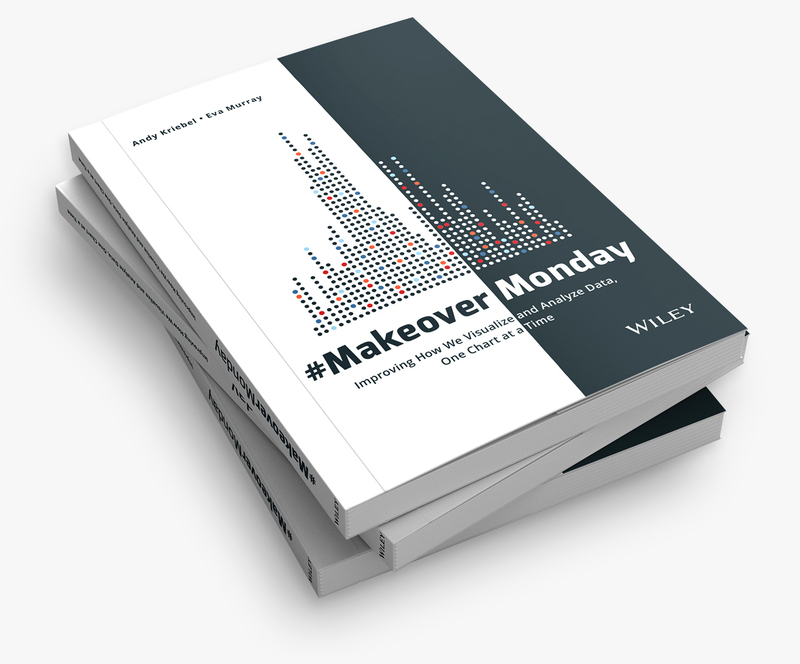 Makeover Monday: Where Do Women Have the Most and Least Political Representation in the U.S.? "Approximately 1,809 women serve in the 50 state legislatures at the beginning of the 2016 legislative session. Women make up 24.5 percent of all state legislators nationwide." Wow! Only 24.5%…that’s sad America. We need to do something about it. 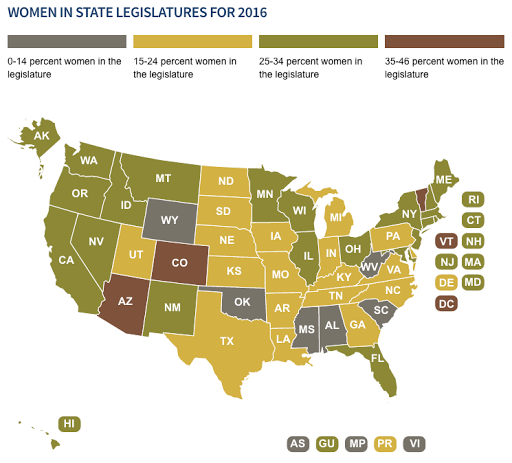 Those figures are accompanied by this map that shows the percentage of women in state legislatures in 2016. But I feel like this is so much more to this story. So when I created the data, I included population rates by state. 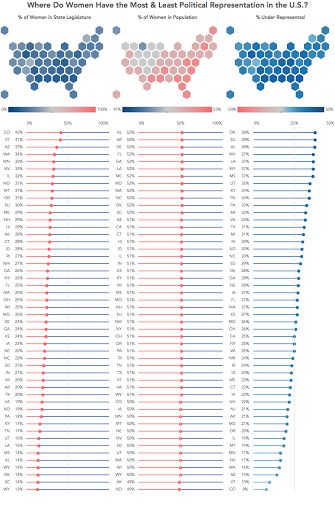 This way I could look at thedisparity between the female population in each U.S. state and the percentage of women in state legislatures. There’s no sense of how under-represented women are. Are we supposed to just assume each state is 50% female then do the math in our head? I think that’s too much work for the reader. Not enough distinction in the colours. Why not use a continuous colour scale? There’s no ranking of the states. How do I identify the best and the worst? Given these recommendations, I’ve create the viz below. I also made this device responsive, so you will see a different viz depending on whether you’re on a computer, tablet or phone. I did this because I want to learn to design for mobile first, something John Burn-Murdoch has recommended to us when he’s come to chat with us at the Data School. 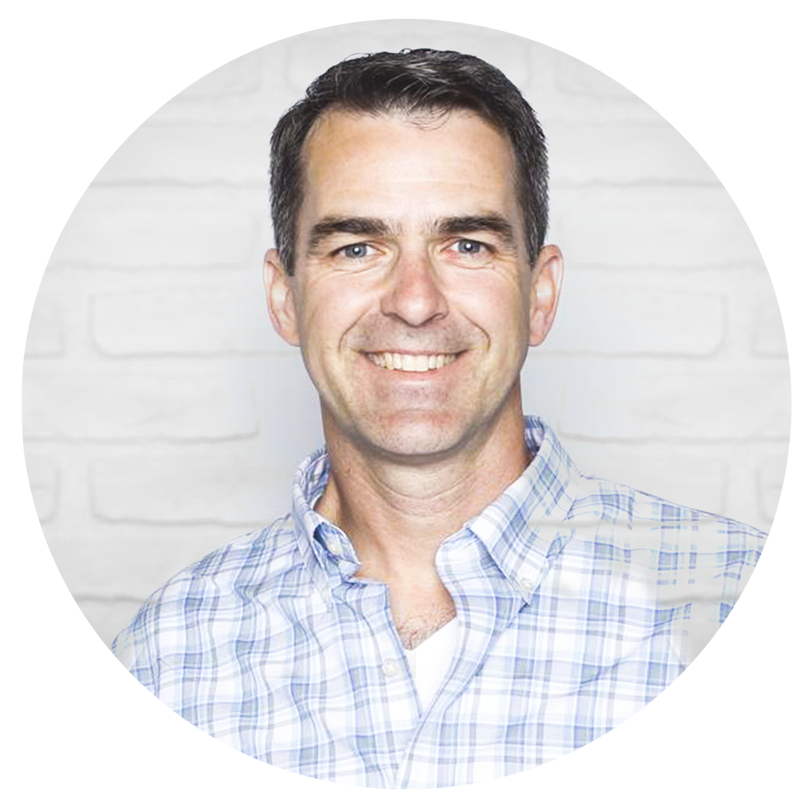 "I also made this device responsive". This is a really cool feature, is this new to Tableau 10? If so, how easy it to use? I did find a "hack" for earlier versions using some CSS, but it isn't very elegant. J, I followed these instructions. I believe 10 is supposed to make this easier, but I don't know how this will impact embedding. Not sure if we'll still need to use CSS to make it work, but I found it pretty simple. Thanks Andy! I hadn't seen this before. Constructive feedback: I had a tough time figuring out what the blue side of your lines were until I realized it seems to be a track to 100%. The left column shows the most represented to least, but the middle and right columns should be sorted so the states are in the same order as the left for easy comparison down the chart without having to use the highlight action. If I want to see how each state does it'd take me all day clicking on one state at a time. Thanks for the feedback Jerry! That was indeed one of the debates that went through my head. My thinking was that it was more intuitive to look down the viz instead of across. I certainly can see what you mean. I appreciate the feedback!